I'm obsessed with chicken waffles. In my university days, I used to buy chicken waffle sandwiches from a window vendor as drunk food, but once I left college, I realized how much I missed dining on chicken waffles on a near weekly basis. 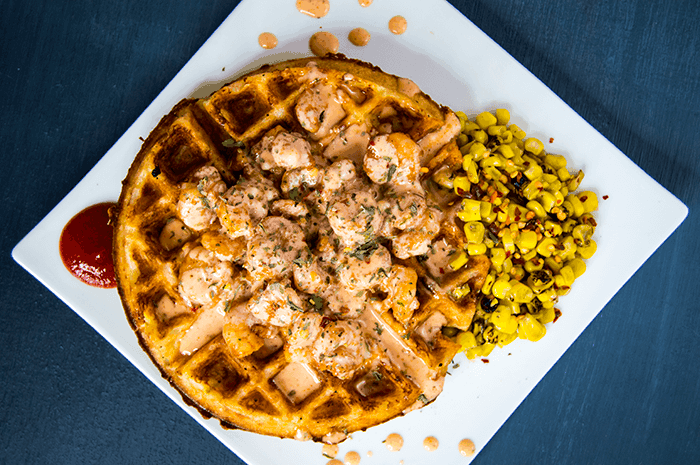 Since college, I've learned to make my own creative takes on chicken waffles but I was recently inspired to try one of my favorite meals in a whole new way. 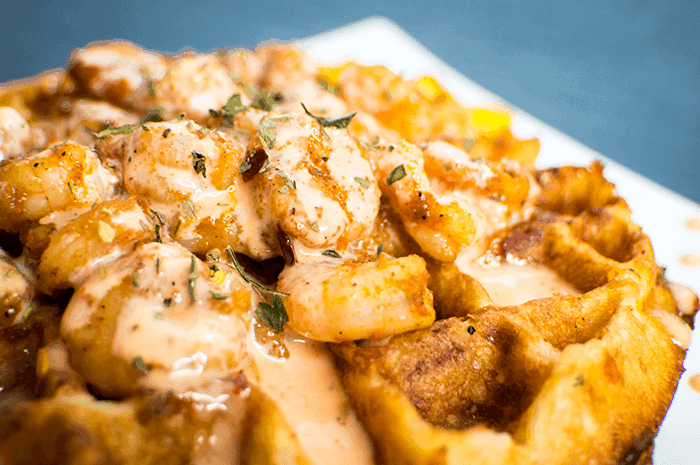 Introducing shrimp 'n' waffles. Tender shrimp in a maple sriracha aioli on top of, wait for it...Red Lobster's Cheddar Bay Biscuits (affiliate link). It's a whole new way to "hack the box" - instead of following the biscuit recipe on the box, stir in ingredients more commonly used to make standard waffles, like milk and whisked eggs. Preheat your waffle iron until it reaches cooking temperature. Grease with spray oil, as needed. In a large bowl, pour in the boxed biscuit mix then stir in milk, whisked eggs and salt. Pour the garlic and herb packet included with the biscuit mix into the melted butter. Whisk then pour the butter into the waffle batter. Let rest for about five minutes. In a small bowl, whisk together the mayonnaise, syrup, sriracha, lime juice, Old Bay and sea salt until a smooth, running sauce forms. Set aside. While the waffle iron preheats and the batter rests, add one tablespoon of oil to a skillet over medium high heat. Toss in the shrimp and cook until no longer opaque. They should be tender, but not tough, when gently pressed on. Remove from the heat or keep warm on the lowest stove setting that will not continue to cook the shrimp. 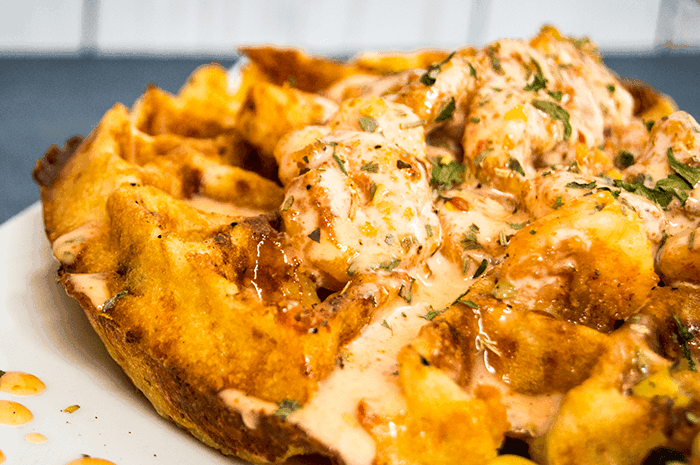 Spread the shrimp over the top of the waffle and pour on the desired amount of sauce. Season with additional Old Bay (optional) and salt and pepper, as desired. I served mine alongside a bed of roasted sweet corn. Enjoy!